Warner Music Entertainment is pleased to announce the UK release of Morrissey: Live At The Hollywood Bowl . 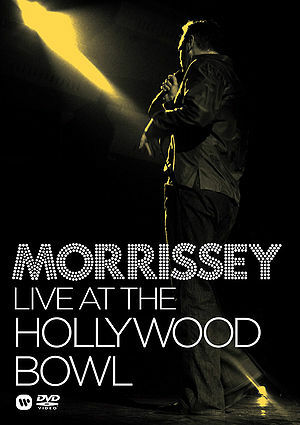 The DVD captures Morrissey Live at the Hollywood Bowl 15 years after his last gig at the legendary venue. A 17,000 plus audience is captivated with a career defining performance that includes The Smiths classic tracks 'The Queen Is Dead', 'The Boy With The Thorn In His Side', 'Girlfriend In A Coma', 'How Soon Is Now? ', 'Please, Please, Please Let Me Get What I Want' and 'There Is A Light That Never Goes Out'. Morrissey's darkly raw and witty lyrics are teamed with a flamboyant stage persona as we see at least 2 shirt strips and a constant flow of impassioned stage invaders. He delivers an unforgettable set spanning three decades of new and classic material on a night where his voice and performance is at it it s very peak. Morrissey: Live at The Hollywood Bowl illustrates just of how much of a lyrical genius Steven Morrissey is. He has influenced many artists over the years and will continue to do so, due to the creative honesty in his words and the passion of his live performances. This DVD is an essential edition to the collection of the committed Smiths & Morrissey faithful. "The slapdash release of Morrissey: Live at the Hollywood Bowl is done by Warner without any consultation to me whatsoever, and is in breach of their terms as laid out by themselves in an agreement made for the film between Warner and my ex-manager. Being Warner, predictably the sleeve art is appalling. It is the work of cash-hounds, and I urge people NOT to buy it. I am not signed to Warner, and no royalties from this DVD will come to me. Following the statement, the release date for the DVD was delayed until March 1, 2009. However, the title was later canceled and has never seen an official release. Promo copies of the disc were found later on auction sites, but due to the limited number pressed and their high value, they remained highly elusive to the general public. The complete DVD leaked on the internet in 2011. The DVD features the music video for the single "That's How People Grow Up". This page was last modified on 27 May 2014, at 08:56.